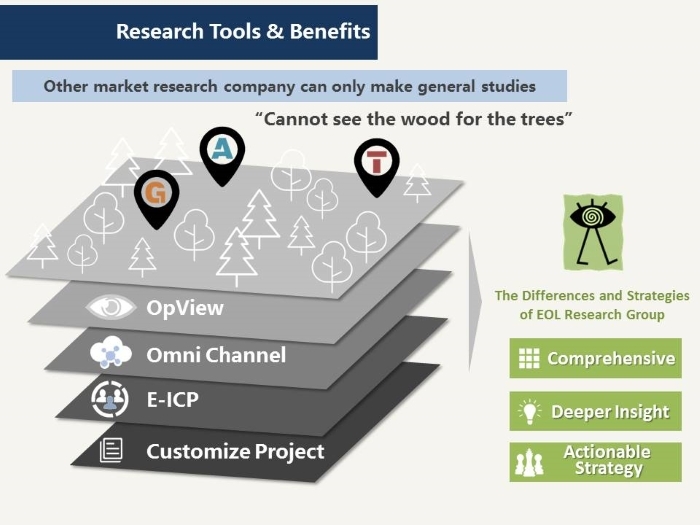 Eastern Online innovates and adopts an original service named ‘Two-Phase Research Model,’ which includes twoinvestigative stages: E-ICP data analysis and customized research project. 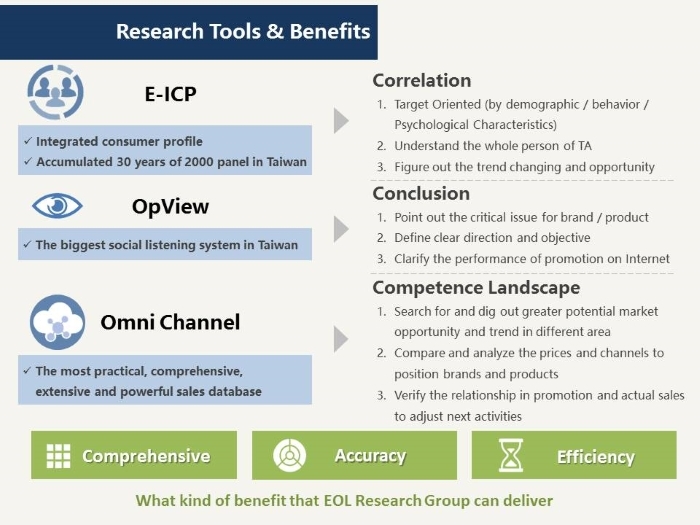 At the first stage, we can quickly diagnose clients’ marketing issues by E-ICP database, the annual Taiwan island-wide lifestyle and consumption survey aged from 13 to 74 since 1988. According to our client feedbacks, usually most of marketing issues could be efficiently and effectively solved by E-ICP analysis. If any issues need to be further probed, we can go for the second phase: customized qualitative or quantitative research project. Based on E-ICP profiling at the first stage, the research design and qualification could be easily and precisely optimized for specific issues to meet clients’ goals. Based on the both outside-in and inside-out approaches, we can generate horizontal full scene learning about lifestyle mega-trend and vertical specific detailed quality of consumer insight. Therefore, research results will clearly reflect dynamic market status and enrich the explanation for consumer lifestyle variation. This also facilitates the fact-based result easily adapted as actionable finding in order to help client make efficient and effective marketing decision and consumer feedback. E-ICP is the abbreviation of “Eastern-Integrated Consumer Profile”. 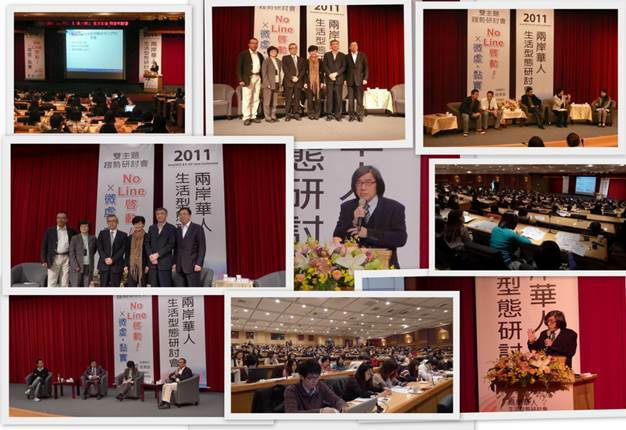 ‧ database in Taiwan, which has operated survey since 1988. ‧Survey period : Annual survey conducting during every June – August . ‧Coverer age: 56 main cities and towns of Taiwan island. Customized research services ：Providing both qualitative research (focus groups or depth interviews)and quantitative research method (face-to-face, telephone , and online surveys).